Jennifer Doubt, Chief Collections Manager, Botany Section at the Canadian Museum of Nature, will share with us what moss is and how it fits in the plant world. Presented by the Gloucester Horticultural Society, 4373 Generation Court. Pre-registration recommended at (613) 749-8897. 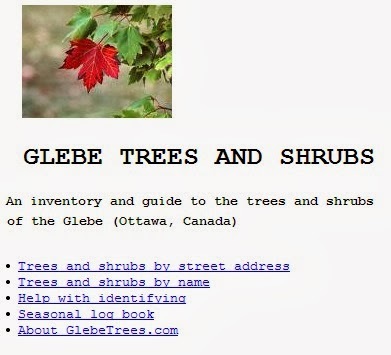 Somehow I came across this resource - what a find: Glebe Trees. It helps identify the trees along each street and also provides a spring log that was created in 2009 documenting the changes in the trees from March until the end of April. You can peruse a nice long list of all the species of trees found in the Glebe and it even has an identification key using size, flowers, leaves, bark, form and season. Brilliant! The project to inventory trees on City rights-of-way led by Carol MacLeod was stymied by technical data entry problems in 2010, but is hoping to continue the project in 2011. Volunteers are always needed. Not sure if the project is still ongoing. What about planting more native trees as per Diana Beresford-Kroeger? What a great topic! Someone emailed me a link to this symposium. The Holtz Center for Science and Technology Studies will host a three-day symposium on the intersections and tensions between sensory or emotive experiences of nature and the bureaucratic, political, and scientific quantification of the environment. How is nature defined and valued, and for or by whom? How have sensory and emotive experiences of the environment been translated into numerical or monetary terms, and are there examples of the reverse phenomenon? When and why have environmentalists adopted numbers or monetary values for conservation ends, and what are the trade-offs of this approach compared to, for example, arguments for the intrinsic value(s) of nature? Who has determined the correspondence between qualitative and quantitative measures of value? How? To what end? How have the values societies ascribe to nature changed over time, how are social and political conflicts over these values adjudicated, and what has been the role of scientific expertise? Melanie Kiechle, Assistant Professor of History, Virginia Tech. "An example of a project that received funding in the first year of this program is the Ritchie Parkette. 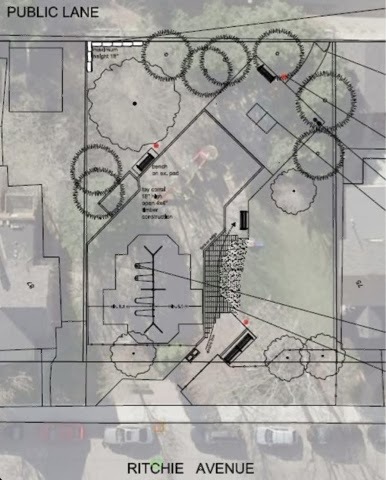 With a $25,000 grant, The Rotary Club of Toronto, the Friends of Ritchie Parkette and the Toronto Department of Parks, Forestry & Recreation will rehabilitate the parkette’s natural environment, introduce wildlife education and programming." It was announced yesterday that the W. Garfield Weston Foundation will support improvements to Ritchie Parkette with a $25,000 grant provided through the Weston Family Parks Challenge. 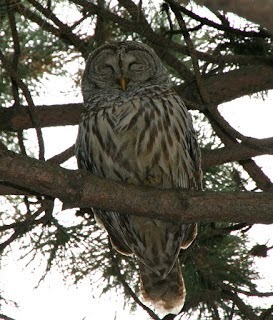 The Rotary Club of Toronto, the Friends of Ritchie Parkette and the Toronto Department of Parks, Forestry & Recreation will use the grant to rehabilitate the parkette’s natural environment, introduce wildlife education and programming. Native species will be planted at the front of the park and some interpretive signage that identifies the plants and describes healthy natural habitats. A chalk board wildlife and bird sighting display and some signage about birds in the area will be erected with links for posting bird, insect and mammal sightings to this blog. Access to a water tap for all seasons. This means sandcastles, rivers through sand tunnels and water for the ice rink in the winter. Thanks to all involved for their time in helping us win this generous grant.